There are many ancient historical references to the new moon and none of them support a conjunction moon, astronomical new moon, nor a dark moon. 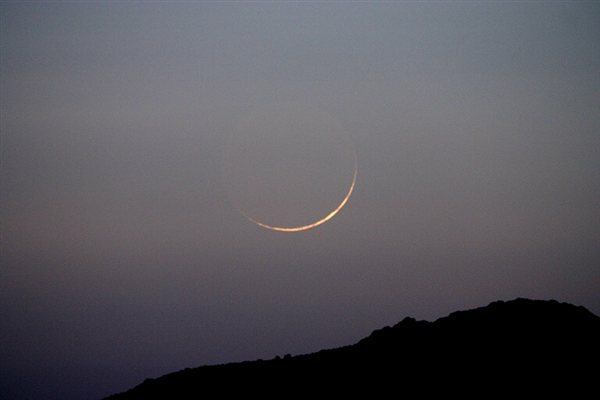 All the historical evidence supports a visible new moon sliver. 1) The Wisdom of Sirach or simply Sirach, and also known as The Book Ecclesiasticus or Siracides is a work from the early 2nd century BCE (approximately 200-175 BCE) written by the Jewish scribe Jesus ben Sirach of Jerusalem. This text tells us that the new moon is aglow and shining. Wisdom of Ben Sira 43:6 And even the shining moon wanes according to its time. Though it is for ruling the seasons and an everlasting sign. 7 By it are the seasons and the times of the statute: And shining, it vanishes in its circuit. 8 The new moon, according to its name renews itself; How wonderful is it when it changes! The beacon of the host wanes on high, leaving the firmament aglow from its shining. 2) The Book of Enoch or 1 Enoch is an ancient work, traditionally ascribed to Enoch, the great-grandfather of Noah. It is not part of the biblical canon as used by Jews, apart from Beta Israel. It is regarded as canonical by the Ethiopian Orthodox Church and Eritrean Orthodox Tewahedo Church. A short section of 1 Enoch 1:9 is quoted in the New Testament (Jude 1:14–15). The older sections (mainly in the Book of the Watchers) are estimated to date from about 300 BCE, and the latest part (Book of Parables) probably was composed at the end of the 1st century BCE. This historical reference tells us that light rises upon the new moon and the dark moon is at the end of the month and not the beginning. Enoch 78:12. And on the first day she is called the new moon, for on that day the light rises upon her. 13. She becomes full moon exactly on the day when the sun sets in the west, and from the east she rises at night, and the moon shines the whole night through till the sun rises over against her and the moon is seen over against the sun. 14. On the side whence the light of the moon comes forth, there again she wanes till all the light vanishes and all the days of the month are at an end, and her circumference is empty, void of light. 3) Philo (20 BCE–50 CE), known also as Philo of Alexandria, Philo Judaeus, Philo Judaeus of Alexandria, Yedidia, Philon, and Philo the Jew, was a Hellenistic Jewish Biblical philosopher born in Alexandria, Egypt. In the Special Laws II:XI:41, he wrote that the new moon is after the conjunction moon. XI. (41) Now there are ten festivals in number, as the law sets them down. The first is that which any one will perhaps be astonished to hear called a festival. This festival is every day. The second festival is the seventh day, which the Hebrews in their native language call the sabbath. The third is that which comes after the conjunction, which happens on the day of the new moon in each month. 4) Philo (20 BCE–50 CE), known also as Philo of Alexandria, Philo Judaeus, Philo Judaeus of Alexandria, Yedidia, Philon, and Philo the Jew, was a Hellenistic Jewish Biblical philosopher born in Alexandria, Egypt. In the Special Laws II:XXVI:140. Philo tells us that at the new moon there is light. He also tells us that at the new moon, the sun begins to illuminate the moon with light which is visible to the outward senses and the moon displays her beauty to the beholders. XXVI. (140) Following the order which we have adopted, we proceed to speak of the third festival, that of the new moon. First of all, because it is the beginning of the month, and the beginning, whether of number or of time, is honourable. Secondly, because at this time there is nothing in the whole of heaven destitute of light. (141) Thirdly, because at that period the more powerful and important body gives a portion of necessary assistance to the less important and weaker body; for, at the time of the new moon, the sun begins to illuminate the moon with a light which is visible to the outward senses, and then she displays her own beauty to the beholders. Also, both the Mishnah and Talmud support only a visible new moon. There are many dozens of examples in these two sources, if one wants to search it out. Brought to you by Yahweh is Truth.